Sunkanmi Ola, the founder of Syracuse Digital, an African digital marketing and product development company based in Lagos, Nigeria. Syracuse Digital was founded in 2012. They help businesses grow through digital engagement marketing. Syracuse counts Adidas, Tecno Mobile, Mitsubishi Motors and Infix among its clients. The company has reached Nigeria, Ghana, Kenya, Ethiopia, South Africa, Cameroon and the UK. Sunkanmi is a result oriented, open minded & confident technology enthusiast. A tactical leader, team builder with the ability to attract key team players. He has grown 2 successful start-ups so far. Sunkanmi was named in Forbes’ 30 Under 30 list (Technology) for 2018. He is also the youngest ever candidate to be admitted into the global executive MBA programme of Hult International Business School. 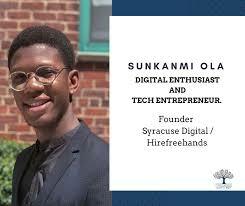 After finishing university in 2012, Sunkanmi Ola founded a digital advertising agency when he saw a gap in the market. During the venture’s early days Ola kept close contact with a mentor who gave him leads on when companies where taking pitches from advertising agencies to market their brands. Established in 2012, Syracuse Digital is a digital advertising and product development agency. They help businesses grow through digital engagement marketing. Syracuse counts Adidas, Tecno Mobile, Mitsubishi Motors and Infinix among its clients. The company has reached Nigeria, Ghana, Kenya, Ethiopia, South Africa, Cameroon and the UK. “I gate crashed pitches, pitting myself against national marketing agencies’ presentations to brands on how my team and I (consisting of a programmer, a designer and a web developer) could grow their brands massively.” After three months of what Ola refers to as “pitch battles” he landed his first client, a leading mobile telecoms manufacturer in West Africa. One of his leading clients is the Tecno Group, which has multiple companies under it, such as Tecno Mobile, Infinix Mobile and PalmChat. Syracuse Digital assists with Tecno’s marketing in both Nigeria and Ghana According to Ola, his company employs eight people (all under the age of 25) and earns US$4,200 in monthly retainer fees, with additional revenues from other activities.